Are you looking for a real wilderness getaway? We are now offering a very unique wilderness experience here at Bulldog Camps! Our remote camp is located on the southwest corner of Enchanted Pond sitting in the shadows of Bulldog Mountain. 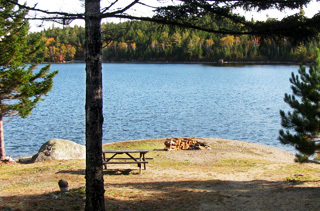 This camp offers our guests the feeling of being even more remote than the camps here at the northeast end of the pond. Access is by boat only and you will get the feeling of total seclusion when you beach the boat at our remote camp. There is a nice beach to enjoy if you are a swimmer and there is great fishing right from shore. 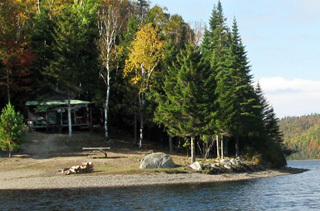 Enjoy watching moose, deer, beavers, and loons as you sit on the front porch overlooking the lake. The camp is very primitive but has a new outhouse close by. Cooking is done over an open fire which adds to the adventure for most. For a chance to totally unwind from a normal busy lifestyle, this may be a stay for you. 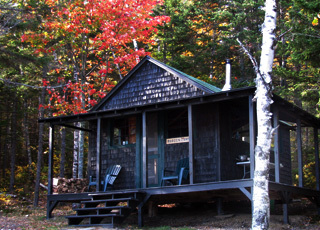 The camp was originally built by a pilot for the Maine Warden Service and later was accessed by seaplane from the second owner. We can still offer seaplane transportation right to the camp for those looking for a step back in time and an adventure recreating what Maine was like several decades ago. 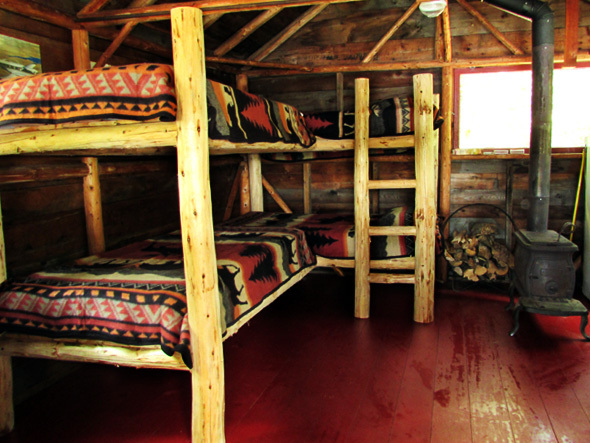 For more information on our remote camp, please call us at (207) 243-2853! Experience a unique wilderness getaway at Bulldog Camps' wilderness camp on the southern end of Enchanted Pond...it's just you and nature.